Hawaiian Moonrise Shell vintage style silver necklace! This very pretty shell has bands of rare green coloration blended with pink, hints of blue and cream color. Accented with sterling silver vintage style findings, the pendant drapes from a medallion style 26 inch long sterling silver box chain necklace. The Moonrise Shell is generously sized at 1 1/4 inches. A very unique style to celebrate the Hawaiian Moonrise Shell with plenty of sterling silver embellishments! Wear with Aloha and a smile! 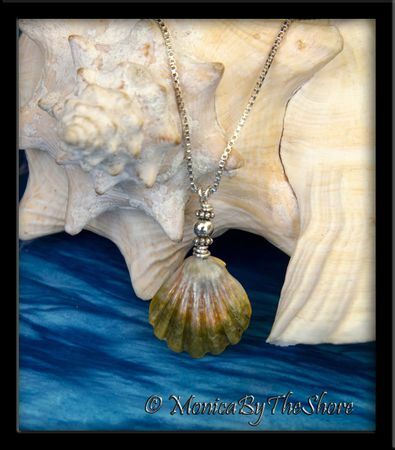 An original Sunrise Shells jewelry creation by MonicaByTheShore of Haleiwa on the North Shore, and Honolulu, Hawaii. 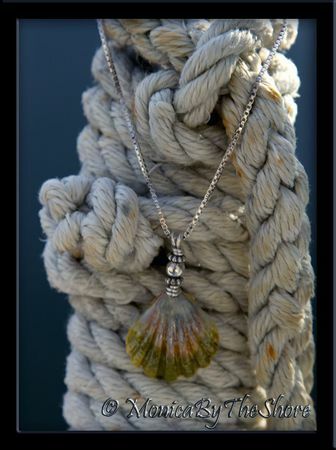 Hand crafted rare seashell designs made with Aloha on Oahu, Hawaii.